Structural hydraulic and civil engineering services provided to JAWS Architects prior to novation to Hutchinson Builders. 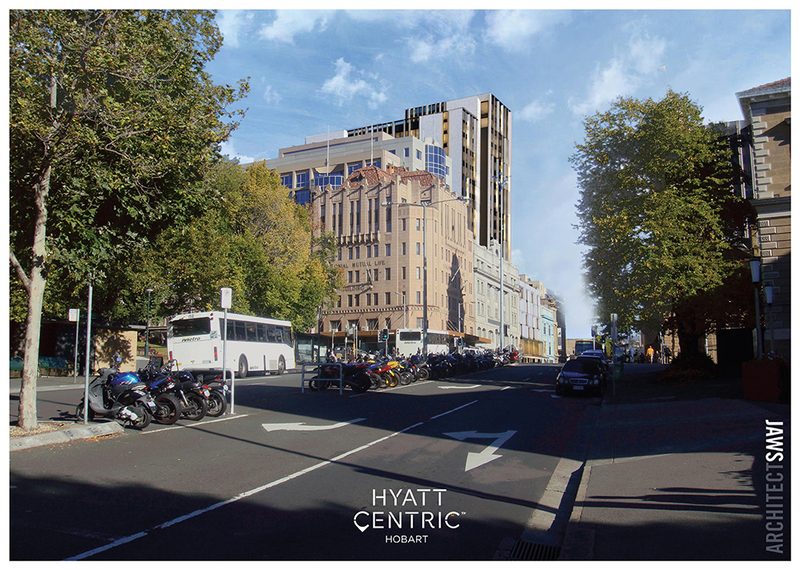 The Hyatt Centric Hotel consists of 20 floors and contains 17 levels of guest rooms, ground level foyer/restaurant and one level of basement carparking. Above the fifth floor, the building narrows to a single tower. Through extensive collaboration with the architect we were able to eliminate transfer structures (despite the changes of use throughout the lower levels of the building) and therefore achieve a simple and cost effective design which also enables efficient and speedy construction. This is a particularly good example of what we call ‘reverse innovation’ – the ability to recognise that whilst innovative solutions exist to solve complex engineering challenges they often come with a hefty price tag and tend to increase risk. Generally, most stakeholders do not find either of these particularly desirable. With some hard work and ingenuity it is far better to eliminate them in a way that still achieves the architectural and functional intent. Height restrictions imposed by the planning authority resulted in lowering the building, and this loss of floor space was in part compensated for with two levels of basement carparking (later reduced to one). This introduced a number of additional challenges, given the proximity of neighbouring buildings. The building documentation was completed within the nominated time frame, and we await the commencement of construction.